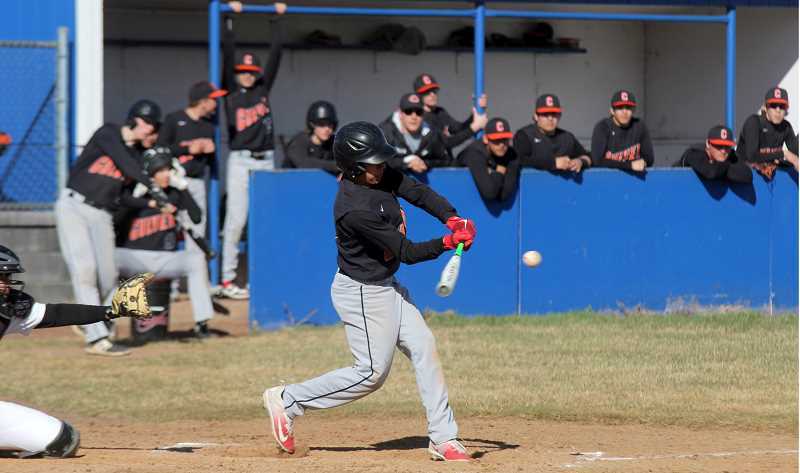 The Madras baseball program hosted the Madras Spring Break Classic March 28-30, with eight teams competing, including the Culver Bulldogs. After the late-winter snowstorms, the tourney marked the first games played in Jefferson County this season. After Madras and Culver both lost their first two games of the tournament, and were matched up with each other, for an early game on Saturday. The White Buffalos were able to hold off the Bulldogs for a very close 11-9 victory. Liam White took the mound to start the game for Madras and the Bulldogs were up to bat first, but could not get things going. Jamal Ortiz was the Bulldogs' choice to start the game on the hill against Madras. Freshman Carter Dunten was walked and Jesse McDonald was hit by a pitch, putting runners on first and second for Madras. Dunten and McDonald were both able to steal bases and both were able to score on a passed ball to put the first runs on the board. Freshman Reece White was walked and was able to steal second with older brother Liam, a junior, at the plate. White crushed the ball on a line drive to center field for an RBI single and the Buffalos took a 3-0 lead after the first inning. Culver was back up to bat, but again could not find ball contact and was held scoreless in the second inning. Sophomore Israel Penaloza was the first up for Madras in the second, and he was walked. Nathan Stout stepped into the batter's box and hit a shot to center for a single. Dunten then hit a deep pop-out fly to center. Penaloza tagged up and made it to third base. With runners on first and third, Jordan Mitchell hit the ball hard down the third baseline for an RBI double. McDonald hit a ball to center that was caught by the Bulldogs, but Stout tagged up at third and scored another run for Madras. The White Buffalos had a big 5-0 lead over the Bulldogs through the first two innings. With one out in the top of the third inning, Brody Little was hit by a pitch and both Tadd Anderson, and Ortiz were walked, loading the bases for Joe Russo. Russo was also walked and Culver scored their first run of the game. Trevor Smith grounded out to second, but Anderson was able to reach home for another Bulldog run. Cylus Hoke was the next batter for Culver and he ripped a shot to right field for a two-RBI single. Lalo Gutierrez was walked and Madras switched pitchers. Freshman Carson King took the mound. Brayden Macy was the first Culver batter to face King and was able to hit a grounder past short for an RBI single. Culver tied the game at 5-5 with Madras up to bat in the bottom of the third inning. Sophomore Anthony Hood replaced Ortiz on the mound for Culver and Reece White and Liam White were both walked for Madras. King hit a grounder straight back at Hood and the ball hit Hood square in the chest. Clearly shaken, Hood tried to make a play to first, but the throw was a bit off target. The overthrow to first allowed Reece White to run free to home plate for a White Buffalo score. Penaloza hit a line drive RBI single to right field on his at-bat and Stout laid down a perfect bunt, scoring both a run and making it to first safely. Madras regained the lead and was up 8-5, heading into the top of the fourth inning. Culver had the bases loaded with two outs in the fourth inning, but couldn't find a way to score. The Buffalos couldn't score in the fourth inning either, but maintained their three-run lead. In the top of the fifth inning, Hood was walked and Anderson hit a grounder up the middle for a single. Ortiz stepped up to the plate with two outs and hit a line drive to left field for an RBI single. Anderson stole third and a bad throw by Madras allowed Anderson to run home and the Bulldogs cut the Madras lead down to one. Smith was the new pitcher on the hill for Culver and Penaloza was up to bat, with the Buffalos up 8-7. Penaloza, Dunten, and Mitchell were all walked and the bases were loaded for McDonald. McDonald was hit by a pitch and Penaloza walked home for Madras. The Buffs then hit into a double play, but had extended their lead to 9-7 heading into inning number six. Hoke hit a ground ball past third for a single to start things off for Culver and Gutierrez was walked. Hoke and Gutierrez both stole a base and there were runners on second and third with Macy up to bat. Macy hit a deep shot to center and the ball was caught, but Hoke tagged up at third for a run. Hood hit the ball over the third baseman for an RBI single, tying the game at 9-9. Lefty pitcher Trent Mitchell then took the mound and closed out the inning. Mitchell was then first up for the Buffs in the bottom of the sixth inning and was hit by a pitch. Liam White was walked and a few pitches later, Mitchell stole third base, putting the Buffs in good scoring position. A balk was called on the Culver closing pitcher, Macy, and Mitchell walked home free, giving Madras the lead back. Penaloza hit the ball to center and White tagged up for another Buffalo run, and MHS had an 11-9 lead heading into the last inning. The Bulldogs had one last chance to tie the game, but Mitchell was able to hold Culver at bay and Madras came away with a 11-9 victory. "I knew I had to get the job done," Mitchell said. "We can't let them score and if we could get through that last inning, then we don't need to play the bottom of the seventh." Ortiz led the way for Culver, going 2-for-4 with an RBI. Macy ended the game 1-for-3 with two RBIs and Hoke was 1-for-4 with two RBIs. Hood went 1-for-3 with an RBI and Russo ended the game 1-for-4 with an RBI. The Bulldogs recorded six hits as a team, but also had seven errors in the game. "I thought we played a good game, we just had some errors that cost us runs and we weren't able to recover from that," Ortiz said. "We have been trying to play them (Madras) for three years. It felt great to play them. The rivalry is there, but we couldn't come out on top." "I think we are going to do good in league," he said. "This was a great practice for league, so we can be ready. We need to work on knowing where to go with the ball and know what happens when it comes to you." Madras was led by Penalazo, who was 1-for-1 with two RBIs and was walked twice. Liam White went 1-for-2 with an RBI and Jordan Mitchell was 1-for-3 with an RBI. Stout and Zemke both went 1-for-4 on the day for the Buffs. As a team, they record five hits, but also had six errors. Madras also recorded seven steals on the day. "I thought we could have done a lot better, considering we made a lot of errors," said Mitchell. "We came out with the win, so we were able to get the job done. It felt good to be at home, but we lost our first two games. We should have won the second one, but came out with the win for our last game." "I know half the kids on that team (Culver) and I was excited to play them, but at the same time, you are a little more nervous," he said. "It is more about having fun against these guys, since I know most of them." "The team needs to work on a little bit of everything; we made a lot of mistakes," Mitchell said. "Relays, throws and batting is what we really need to work on. Batting has been a weak point so far." 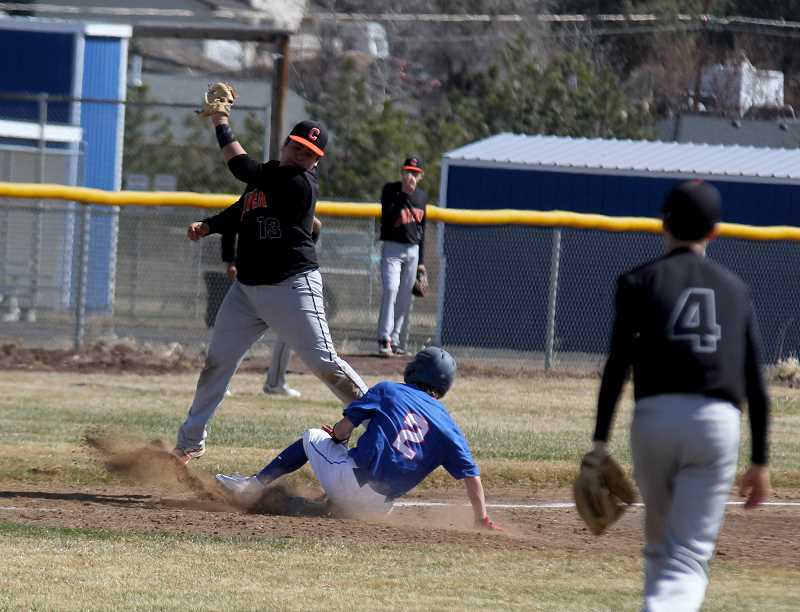 Madras lost to 5A Crook County 11-1 in their first game and lost a close 9-8 game to Elmira in their second game. 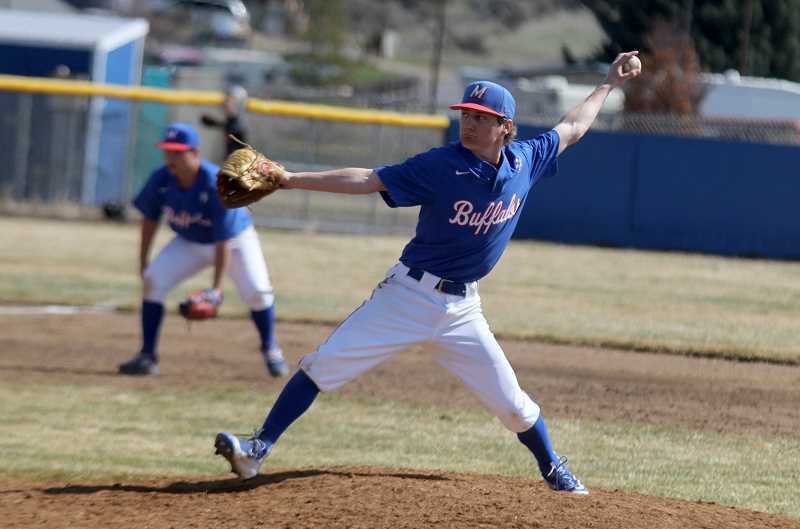 The Buffalos played Crook County on March 28, and had some trouble hitting off Cowboy pitcher Kyle Knudtson, who only gave up one hit and struck out seven White Buffalos. The Cowboys were able to put four runs on the board in the first three innings of the game, taking an early lead. In the bottom of the third inning, Jordan Mitchell made it to second base with Kody Zemke at the plate. Zemke hit the ball to shallow right field for an RBI single and the Buffalos ended the inning down 4-1. Crook County hit in seven runs on seven RBIs in the fourth inning, taking a big 10-run point lead. The Buffalos and the Cowboys were both held scoreless the rest of the game and Crook County beat Madras in five innings. The Cowboys recorded 11 hits and no errors, while the Buffalos recorded one hit and three errors. Crook County also ended the day striking out nine White Buffalo batters, while Madras was unable to record a strikeout. After losing to Crook County, the White Buffalos were matched up with Elmira, Friday, March 29. Elmira was able to score in the first inning, taking a 1-0 lead. Dunten started the Buffs off with a line drive double to center. Jordan Mitchell was walked and Dunten stole third on a passed ball. Dunten then scored on a wild pitch, tying the game. Mitchell also stole third and was able to score when the Elmira catcher dropped a strikeout pitch and threw the ball to first. In the top of the second inning, Madras pitcher Zemke struck out all three batters. Madras and Elmira were held scoreless in both the second and third innings, with Zemke striking out five of six batters. A bad throw to third with a runner on base gave Emira a run. Later, the Falcons scored on a passed ball, taking a 3-2 lead heading into the bottom of the fourth. Penaloza and Stout were both walked to start the inning. A few outs later, Dunten was walked, loading the bases for Jordan Mitchell. Mitchell was hit by a pitch and Penaloza scored for the Buffs. Zemke stepped to the plate and hit a hard line drive to left field for an RBI single. Madras took a 4-3 lead after four innings. Reece White took the mound in the fifth inning, and Elmira hit a line drive in the gap of center and right field, scoring two runs. In the bottom of the fifth, Liam White and Penaloza were both walked. Reece White laid down a great sacrifice bunt to advance the runners. Liam White scored on a bad pickoff to third base and King hit a deep shot to center, scoring Penaloza, who tagged up at third. McDonald, Dunten and Jordan Mitchell were all walked and bases were loaded with Zemke up. Zemke was also walked and McDonald walked home. Madras took a 7-5 lead heading into inning number six. 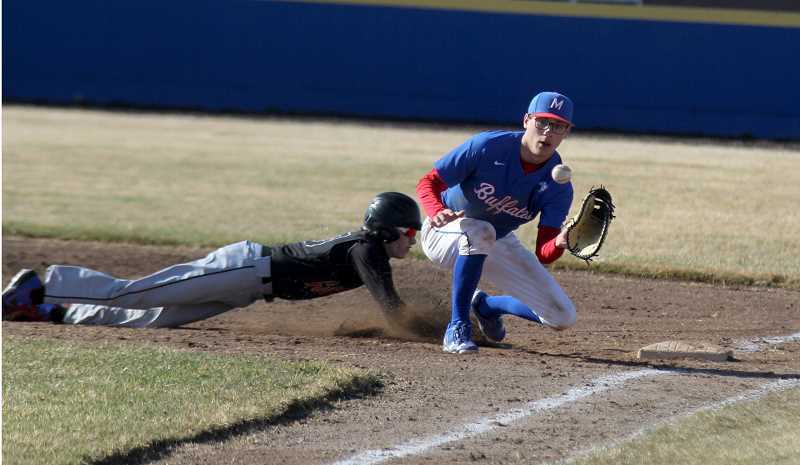 The Buffalos and Falcons were held scoreless in the sixth inning and Madras had a two-run lead with one inning left. But they couldn't hold it. With two runners on base, the Falcons hit a very deep hit to center field, scoring two runs. The next Elmira batter hit the ball to right field and another run scored for Elmira. The White Buffalos couldn't score in the last inning and the Falcons came away with a 9-8 win over Madras. Elmira recorded 10 team hits and two errors, while the Buffs had six team hits and three errors. The Falcons struck out eight times and the Buffalos struck out 14 times. Jordan Mitchell ended the day going 1-for-2 with an RBI and Zemke went 1-for-3 with two RBIs. McDonald went 1-for-2 and both Penaloza and Dunten ended the day 1-for-3. Madras travels to Corbett on Friday, April 5, and has a home game against those same Cardinals at 4:30 p.m. Monday, April 8. The Culver Bulldogs were matched up with 4A Cascade on Thursday, March 28 and lost 11-0. Culver was missing some key players in the tournament, but was only down 1-0 after the first inning. Cascade exploded for eight runs in the second inning, taking an early 9-0 lead. Cascade was able to score two more runs in the top of the fifth inning, securing their win in five innings played. For the Bulldogs, Anderson had a good day batting, going 2-for-2 with a single and a double. Smith went 1-for-2 and Hood finished the game 1-for-3. After the Bulldog loss to Cascade, they were matched against 4A McLoughlin on Friday. The Bulldogs and the Pioneers were held scoreless to start the game, until the bottom of the second inning. Cord Gomes started things off with a deep triple in the gap of left and center field. Ortiz hit a ground out to shortstop, scoring Gomes, giving Culver a 1-0 lead. McLoughlin went on a batting spree in the bottom of the second inning, scoring five runs and taking a big lead. Hood was able to hit a grounder between short and third to start the top of the third inning. Little was walked and Anderson hit the ball to center field for an out, but Hood tagged up for a score. Little also stole two bases, including a run after scoring on a passed ball, cutting the Pioneer lead down to 5-3. The score remained 5-3, until the top of the fifth inning. Little started things off with a single to shallow center. Anderson and Gomes were both walked and the bases were loaded for Ortiz. Ortiz hit a grounder between first and second for a two RBI single. Smith stepped to the plate and hit a shot to shallow right field, scoring two runs and making it to third base on some bad Pioneer throws. Gutierrez hit a ground out, but Smith scored on the throw to first. Gabe Wilson was walked and Macy hit a ground ball to third base, but an overthrow to first saw another Bulldog score and Macy made it to third. Culver scored six runs in the fifth inning and took a 9-5 lead. The Pioneers went on another big hitting spree and scored five runs in the bottom of the fifth inning to retake the lead. Anderson hit a grounder past short and Gomes, a line drive single. They both stole a base. With runners on second and third, Ortiz was up to bat. He hit a ball right down the right field line for a two-RBI single. Culver had an 11-10 lead heading into the bottom of the sixth inning. McLoughlin scored two runs with two outs in the inning and the Bulldogs couldn't score in the seventh inning and lost to the Pioneers 12-11. Ortiz ended the game 2-for-4 with a single, double and three RBIs. Gomes went 2-for-2 with a triple and Anderson ended the day 1-for-3 with an RBI. Hood, Little and Smith all went 1-for-3. Culver started league play Monday, April 1, against Western Christian. They have a home game against Sheridan at 4 p.m. Monday, April 8.